For this commission, the client was looking for something very similar to my Terra Human painting “Fragmentation.” Nature is always there to comfort us when we need it the most. If we listen closely we can learn from its ancient wisdom and perfect harmony. This commissioned painting was a pleasure to create. The client wanted the piece to have a very similar look and composition to my Terra Human painting “Surrender.” This piece illustrates quiet strength and the reassurance of knowing your identity and sticking to it through thick and thin. This commissioned painting required a lot of planning and attention to detail. 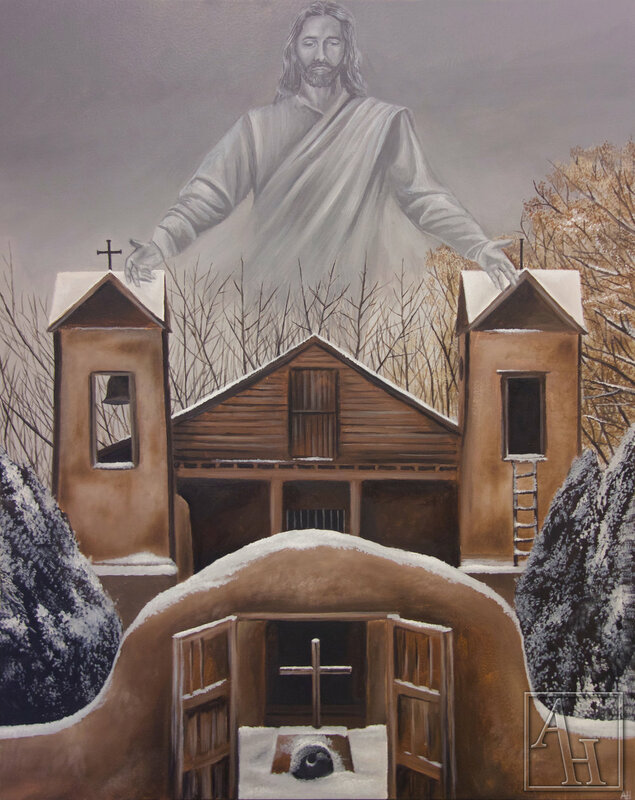 The client sent me a personal photo of Roman Catholic church El Santuario de Chimayo and requested to have an illustration of Jesus over the church with his arms outstretched. This commission was a pleasure to create and it really pushed my skills to a new level. This commissioned painting was a fun pet portrait of my friend's dog Nelly. I really enjoyed working on this piece because I felt it showed the strength in companionship and unconditional love. This person has a strong emotional connection to her dog in a way that seems they both heavily rely on each other for support in a sort of give and take. I felt honored to create this painting for her. 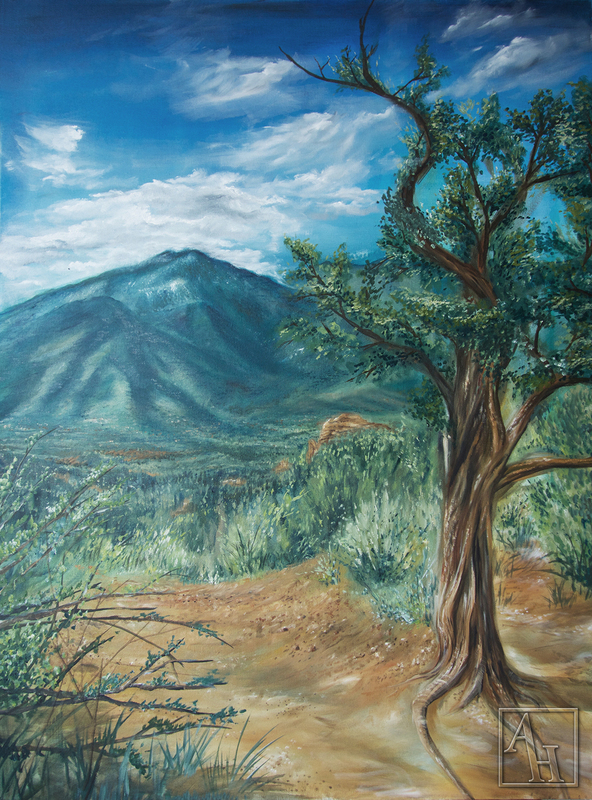 This commissioned painting was meant to capture the beautiful and dynamic colors and textures of Colorado Springs. The client wanted to showcase Colorado springs as it was the stage for the beginnings of a significant relationship. This commissioned painting started with basic instructions to create an abstract landscape with a brown color palette. "Relational Harmony" brings to light the harmony found in the imperfections of familial relationships. The flaws, blemishes and mistakes found in a landscape can make it as unique and dynamic as a human relationship if we approach it with compassion and love. This commissioned painting was meant to highlight the vibrant colors found in a landscape and how they can inspire the viewer. The client wanted to see the changing colors in the aspen trees and how they contrast the pine trees. Working on this piece gave me a great appreciation for the time and effort it takes to replicate the subtleties of nature. This commissioned piece was for new family who wanted to be represented in a futuristic and fantastical way. The several artworks I have created showcasing robots tend to create contrasting themes of human intimacy and connection shown in a robotic form. This commissioned piece was made for a close friend in Colorado Springs who had a special connection to Garden of the Gods. This piece explores the light and feathery nature of Colorado Snow and how it interacts with dynamic landscapes. The grand nature of the entrance to Garden of the Gods frames the fading landscape. Buy "Garden of the Gods Entrance"
This commissioned piece was made for a close friend in Colorado Springs who had a special connection to Garden of the Gods. This painting was a slightly abstract representation of an already dynamic Colorado landscape. The organic brushwork allowed bushes and trees to twist and turn in a more impressionist fashion. 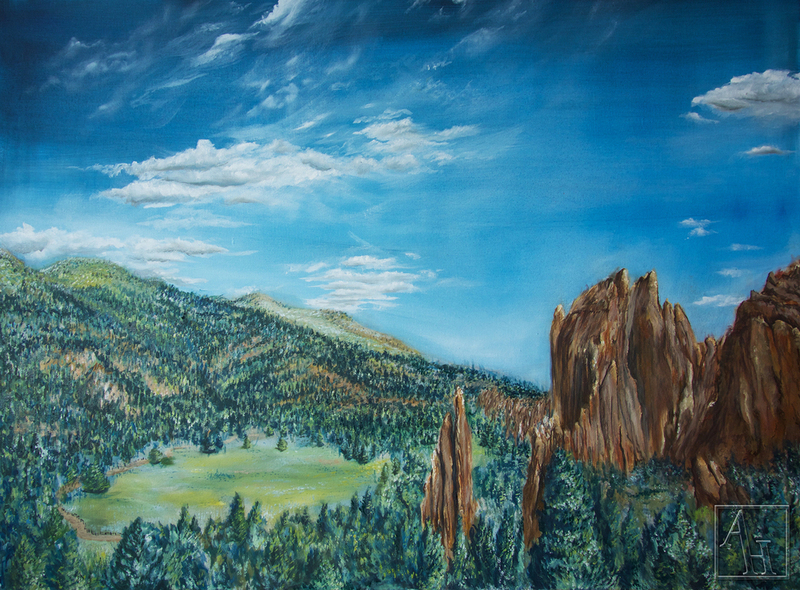 This commissioned piece was made for a close friend in Colorado Springs who had a special connection to Garden of the Gods.This piece showcases the unique rock structures found in Garden of the Gods contrasting the expansive blue Colorado Sky. The harmony of foliage and sturdy rocks is also a predominant theme. This commissioned piece was made for a close friend in Colorado Springs who had a special connection to Garden of the Gods. This piece highlights the resistant plants that grow in the Colorado desert environment. This back view of Garden of the Gods shows how the landscape dips into a vast valley sprinkled with peaks of rocks. This commissioned piece was made for a close friend in Colorado Springs who had a special connection to Garden of the Gods. This painting focuses on the unique rock structures found in Garden of the Gods and how they fold and stack on each other. These rocks tend to frame the surrounding landscape now matter what perspective you look at them from. 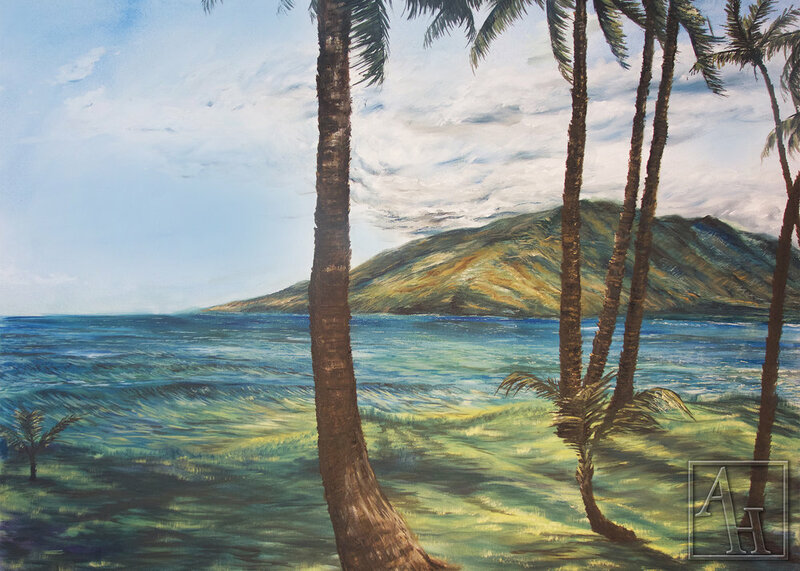 This piece was a gift to my parents and it focuses on warm tropical environment of a Maui beach. In order to capture the variety of textures in this area I used a more impressionistic technique and I feel it gives the piece more movement. This piece was a birthday present for my dad. It showcases the warm Maui sunrise and how it casts shadows on the lush tropical greenery. This commissioned was for the dean of students at my college. This piece displayed the ever changing landscape of Colorado Springs in an impressionistic style. The subtle colors of a landscape can give it a cohesive and organic feel.